This post brought to you by Campbell’s Soup Company . The content and opinions expressed below are that of My Mommy Style. I don’t know about you, but I am always looking for meals that are quick and easy. With school back in full swing I feel like the hours between school ending and dinner time fly by and there are some days I haven’t even thought about dinner when it’s time to have it on the table. Well, I recently tried @Campbell’s Homestyle Light baked potato soup and was so excited about how fast it was to heat it up. 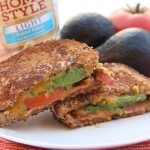 I paired the soup with bacon avocado grilled cheese sandwiches and had dinner on the table in 20 minutes! I was also excited that Campbell’s Homestyle soups are made a with farm grown vegetables and have no added preservatives. I love discovering new products that make dinner time easier and with 29 varieties of Campbell’s homestyle soups I know you will find one that you love. Soup and sandwich is a magical combination and makes for a super easy dinner that everyone will be happy about. Make dinner even more magical with Campbell’s new products. Place 1/4 cup cheese 4 of the bread slices. Divide bacon, tomato and avocado evenly onto bread. Top with remaining cheese and bread slices. Spread 2 teaspoons butter over each top slice of bread. Heat a large skillet over medium heat. Place sandwiches, buttered side down. Spread remaining butter over top slices of bread. Cook uncovered about 5 minutes or until bottoms are golden brown. Turn; cook 2 to 3 minutes longer or until bottoms are golden brown and cheese is melted. Click here to find more delicious Campbell’s recipes. Don’t forget to like us on Facebook, and watch our day to day happenings on Pinterest and Instagram! Linked up with Buns in My Oven, Katherine’s Corner, Tidy Mom, The Pin Junkie and Saving 4 Six.